Annie is left in charge when the cyborg returns and renders Tom and Kevin amnesiac. The title of this episode was inspired by the 1984-1990 sitcom Charles in Charge, in which a young college student, in exchange for free rent, takes care of the housekeeping and babysitting for a family when the parents are at work or socializing. In this episode, Annie finds herself in a similar situation, caring for the tree-house and family when Tom and Kevin are rendered amnesiac after exposure to a neural agent from the weapons systems of the cyborg (last seen in "Future Boy"). At the very beginning of the episode, we see that the Porters have constructed a new backboard and hoop for playing basketball. 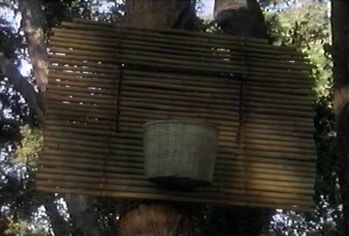 In "Kevin vs. the Volcano", we see a homemade bamboo backboard with a wicker basket attached. 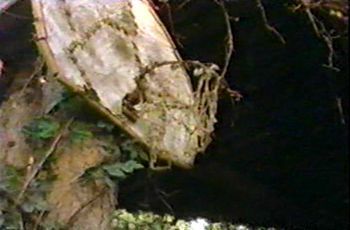 Here, the backboard is made of some unknown white material stitched together and a hoop made up of a couple of curved branches wound into a circle with a net of thin vines. It is plausible that the previous setup got busted and they constructed a new one with different materials. But how do they suddenly have a real basketball to play with? They previously had to make do with a homemade ball as well! 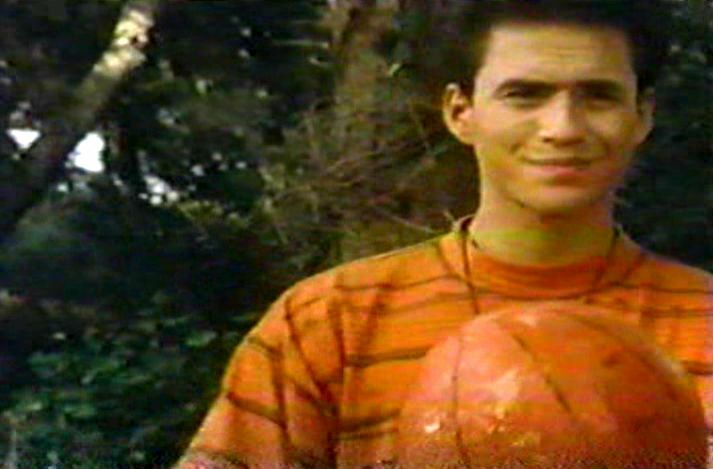 No-prize time: the real basketball had a hole in it and wouldn't hold air and, so, was unusable. But the Porters later found a means of mixing some kind of resin with which they were able to repair it. At 0:21-0:36 in the episode, the boom mike is visible in the reflection off the Jeep window. 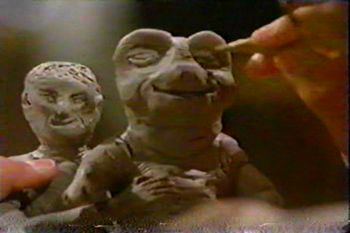 At 1:00 in the episode, we again see Annie's proficiency in the arts as she sculpts a small statue of her father and Tasha out of clay. Kevin and Annie sure do like to use names as insults throughout this series. Previously, we've heard them use the terms Waldo, Barney, and Gumby. Here, at 2:33, Annie says to Kevin, "You're such a Wilbur." I wonder if the producers consciously wanted to avoid using real-world insults on the show (we also hear such insults as wart-breath, toad-sucker, etc.). Perhaps they did not want to encourage children in the use of real insults with their peers. Also, by making them unusual, the insults don't become dated when the episodes are viewed in later years. Stink explains that, once again, Christa is gone somewhere fishing, "too far" away to summon for help in the search for Tom and Kevin. After being knocked unconscious by the cyborg's gas weapon and lying all night in the middle of the jungle, Tom and Kevin are lucky they were not unceremoniously gobbled up by a nocturnal predator! Given amnesia by the cyborg's gas weapon, it is fun to see Tom and Kevin discover, as if for the first time, that they are in the Land of the Lost and not on Earth. 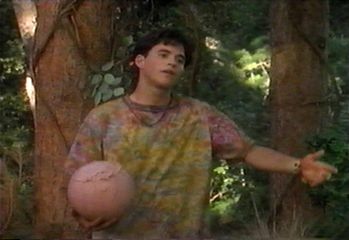 In an amusing moment at 12:19 in the episode, an amnesiac Tom slaps himself in an attempt to wake himself up from what he believes must be a dino-filled dream. In this episode we learn that Annie's middle name is Marie. Kevin must talk about Michael Jordan a lot because Stink and Christa (who otherwise wouldn't know about him) are both incredulously amused when he says that's his name. We've seen in this episode and others previous that Kevin has an orange t-shirt with black markings. Not anymore! It appears they have sacrificed it to make a pair of makeshift gas masks for Kevin and Tom. 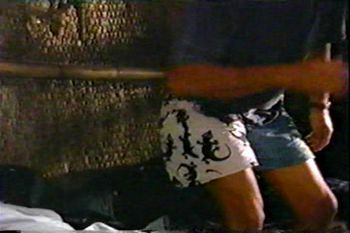 At the end of the episode, Tom is seen wearing boxers that have a lizard design on them. The lizard looks very similar to the lizard symbols found in Shung's temple and other Sleestak ruins. The boxers Tom is wearing also look as though they may have been mended by sewing the halves of two different pairs together. Notice that one half is white (with the green lizard design) and the other half is solid blue. 5:37 Stink says, "Acuba ne, Annie Porter." "Greetings, Annie Porter." 10:09 Stink says, "Acuba ne, Annie Porter." "Greetings, Annie Porter." 10:40 Stink says, "Komadi." "Sorry." 10:42 Stink says, "Miyog." "Too far." 13:47 Christa says, "Acuba ne, Porters." "Greetings, Porters." 18:03 Stink says, "Komadi." "Sorry." 20:48 Stink says, "Acuba ne, Christa." "Greetings, Christa." 20:51 Christa says, "Acuba ne, Stink." "Greetings, Stink." 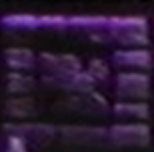 We see that the cyborg has constructed a fortress for himself, but we only see the outside of one wall. How big is it? What is contained inside?